"This is a little something special I came up with. 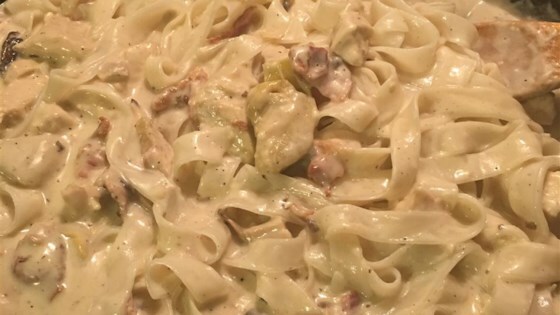 It consists of cooked boneless chicken breasts smothered in bacon, mushrooms, artichokes, olives, and mushrooms in a creamy sauce. Serve over cooked penne pasta, if desired." Fry bacon in a large skillet over medium heat. Remove from skillet, leaving 3 tablespoons of the bacon grease in the skillet. Set bacon aside. Add mushrooms to skillet and saute for 3 to 4 minutes over medium-high heat. Reduce heat to low and add the chicken, artichoke hearts, soup, cream, olives, Parmesan cheese, garlic and salt and pepper to taste. When this mixture begins to simmer, slowly stir in feta cheese. Crumble the bacon into the skillet and let all simmer, stirring often, for 5 to 10 minutes. No one in my family liked this, including me and I like just about everything. I make this all the time, it is my favorite recipe. Every time I make it for guests they want the recipe. I wouldn't change a thing with this!